Materials for the Direct Restoration of Teeth focuses on the important role teeth play in our lives and how biomaterials scientists are ensuring that new dental materials are functional and esthetic. 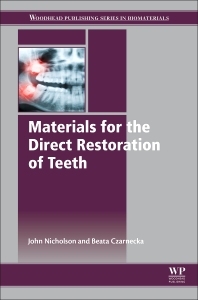 As research in the field is shifting away from traditional materials like metal, and towards more advanced materials, such as resins and ceramics, this book on the subject of modern materials for the direct repair of teeth provides readers with a comprehensive reference. The most pertinent modern dental materials and their properties and applications for the direct restoration of teeth are presented, along with case examples and guidance notes making this book an essential companion for materials scientists and clinicians. Academic and industry researchers, restorative and general dental clinicians. Professor John Nicholson PhD DSc, leads the Biomaterials Group in the School of Sport, Health and Applied Science, at St Mary’s University, Twickenham, London, UK. He is a materials scientist with over thirty years’ experience researching, lecturing and publishing on aesthetic repair materials for teeth. He developed the widely used classification for modern repair materials, and has published over 170 original scientific papers in this field. He is a former President of the UK Society for Biomaterials. Professor Beata Czarnecka DDS PhD, leads the Department of Biomaterials and Experimental Dentistry, at the University of Medical Sciences, Poznan, Poland. She has over 20 years’ experience of researching both fundamental properties and clinical applications of modern materials for the direct repair of teeth, and has published her findings in leading international journals. In addition, she contributes widely to national and international conferences. She also maintains her own private dental practice, and has extensive experience in the practical application of modern repair materials.